MANNY PACQUIAO WAS encouraged on Monday to hang up his gloves before his luck runs out — by sparring partner and “good friend” Amir Khan. 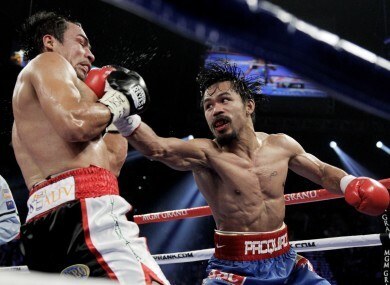 Pacquiao, an eight-division world champion, controversially retained his welterweight title on the judges’ scorecards despite being outboxed by Juan Manuel Marquez for large parts of their Vegas contest last weekend. The Filipino’s narrow win finally put an excellent trilogy of fights against Marquez to bed and seemed to clear the way for a money-spinning superfight against Floyd Mayweather Jr next year. But Khan, who is also trained by legendary cornerman Freddy Roach, feels that it may be in Pacquiao’s best interests to retire gracefully before he is found out by Mayweather and ruins his legacy. “The more he fights, the more it might take some of the gloss off his great legacy as the best fighter in the world. On the strength of this performance, he wouldn’t beat Floyd Mayweather Jr. For his sake, we have to be honest. He is my friend. Email “Khan: Pacquiao should quit boxing before he gets walloped by Mayweather”. Feedback on “Khan: Pacquiao should quit boxing before he gets walloped by Mayweather”.